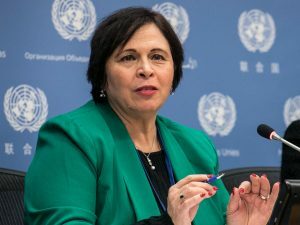 Randa Siniora is a human rights and women’s rights defender of over 30 years experience. She is currently the General Director of the Women’s Center for Legal Aid and Counseling in Jerusalem. Randa’s work has focused on advocacy and networking for progressive change in civil society organizations, UN agencies, and governments at national, regional and international levels. She began her career as a legal researcher and coordinator of the women’s rights programme at Al-Haq, where she later served as director from 2001-2005. She has also worked as a human rights specialist with good-governance organizations in the occupied Palestinian territory, and was Head of the Advocacy and Networking Department at WCLAC from 1997-2001. Before leading WCLAC, Randa served as the senior Executive Director of the Independent Commission for Human Rights in Palestine.